Always working on something new. Here are a few projects that are underway that will be available before summer 2013. 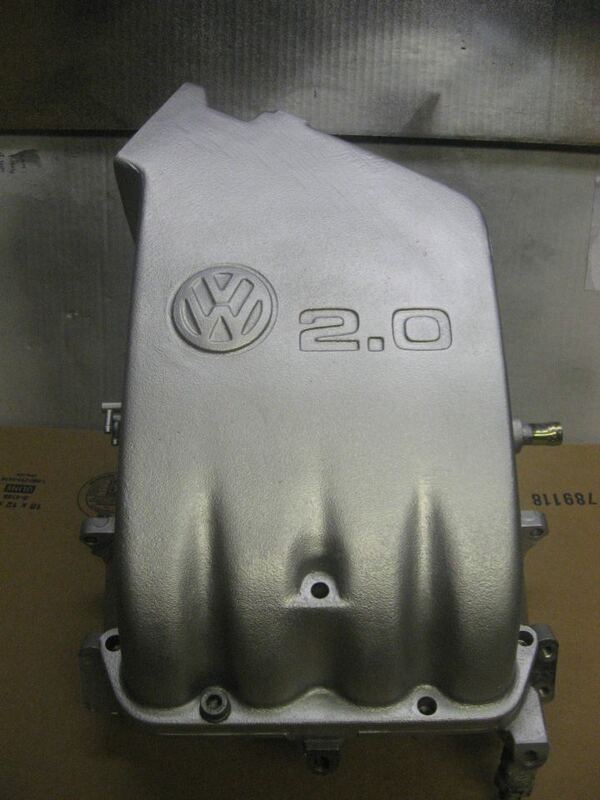 .Customized VR6 12 valve intake manifold. Cold Air intake for MK1 CIS. Wide Band control for CIS. Keep your stock ECU, Keep CIS - add tunability. The Wide band wiring harness and an Innovate MTX-L wide band controller provides a simple way to add fuel management and tune-ability while keeping all the original CIS K-Jet components and reliability in tact. Installation and tuning insctuctions included. Even air flow to each cylinder – Stock intakes vary by more than 10% to each cylinder; making it impossible for the fuel injection system to deliver the proper amount of fuel for smooth and best power. Increased air flow- Often once upgrades are added, the head will out flow the intake manifold leaving the intake manifold as the next big restriction. 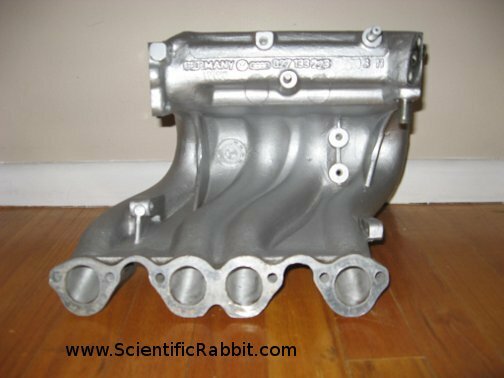 OEM/Stock intake manifolds are mass produced, leaving performance out. Stage I (7 HP gain) - For street applications. for best results, G cam or larger, dual outlet manifold or headers recommended. No loss of low end power, good mid-range gains. 10% more flow over stock. 7 HP gains depending of other modifications. Ported to accept 52mm big bore throttle body. Stage III (7+ HP gain)– For hot street, boosted and racing applications, mid to high rpm gains. For best results use with modified head, cam and exhaust. 25% more flow over stock. More than 7 HP gains depending of other modifications. Extensive porting with re-welded plenum. Ported to accept 52mm big bore throttle body. 1.8L counter flow engine with 8 valves, throttle body is on the passenger side of the engine bay, intake manifold mounts on the rear of the engine above the exhaust. Stage I - For street applications. for best results, 268 cam or larger, dual outlet manifold or headers recommended. No loss of low end power, good mid-range gains. 9% more flow over stock. 7 HP gains depending of other modifications. Stage III - For hot street, boosted and racing applications, mid to high rpm gains. For best results use with modified head, cam and exhaust. 18% more flow over stock. More than 7 HP gains depending of other modifications. Extensive porting with re-welded plenum. 2.0 cross flow engine with 8 valves, throttle body is on the passenger side of the engine bay. Stage III For hot street, boosted and racing applications. For best results use with modified head, cam and exhaust. 10% more flow over stock. 1.8 counter flow superscharded engine with 8 valves, throttle body is on the drivers side of the engine bay. Stage III For hot street, boosted and racing applications. For best results use with modified head, cam and exhaust. 20% more flow over stock. Stage III For hot street, boosted and racing applications. For best results use with modified head, cam. 20% more flow over stock. 1999.9 -2005 (VW MK4 8 valve) 20 WHP @ 3000 rpm and 10 WHP at max rpm. Golf/Jetta 2.0 8 valve cross flow engine Throttle body on drivers side of engine bay with the manifold attached to head in front of engine. 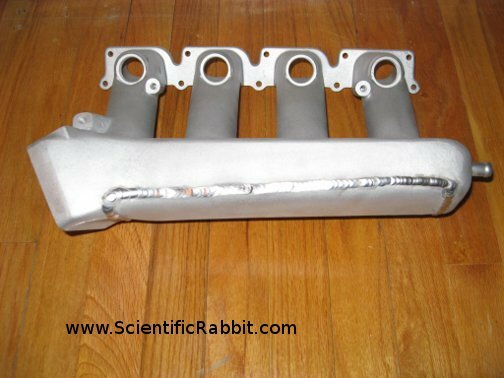 Customer Quote: -Just installed the intake manifold, now the car revs up like a Honda! Just drove it couple miles, feels so light, pulls nice! Stage III - For street, boosted and racing applications, mid to high rpm gains. For best results use with modified head, cam, chip and exhaust. 10% more flow over stock. Golf/Jetta 1.8 16 /20valve Turbo engine with the manifold attached to head in front of engine. Dyno run showed 15 WHP gain in the mid range. 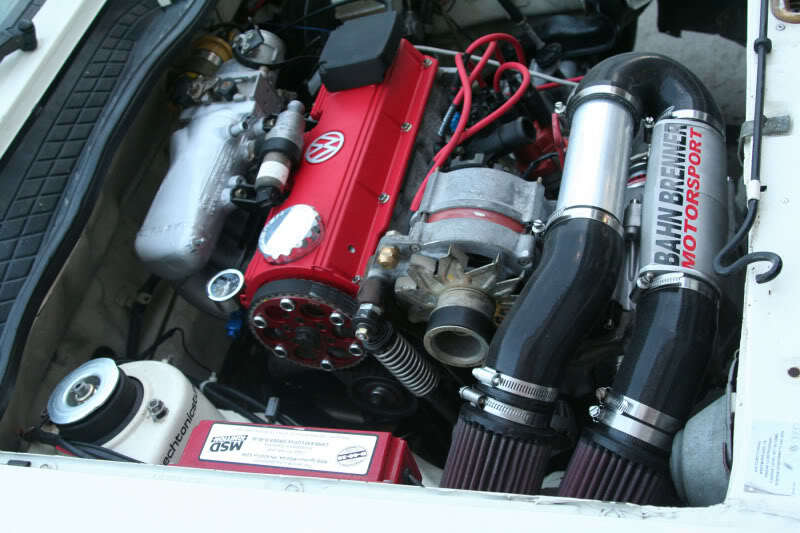 The test motor was a stock AWP with 30# injectors, 4 bar fuel pressure regulator, water to air intercooler, and pushing 15psi out of a K03 Turbo. Stage III - For hot street, boosted and racing applications, mid to high rpm gains. For best results use with modified head, cam, chip, and exhaust.